I've written you a couple of times about my problems with Cyanobacteria. I've done what you told me to regarding the circulation, Caulerpa, etc. However, now I have an orange-yellow looking substance growing all over my tank. This on top of the red Cyanobacteria is only getting worse. Any suggestions? Question: I hope you can help me!! I have a 30 gallon reef tank which has been set up for 3 years, I have 3 VHO's, protein skimmer and two power heads. The problem is I have dark red, almost black, algae covering the whole bottom of my tank and it is now starting to cover my live rock. I do monthly water changes of about 20%. Please help me, I remove it and it is back the next day. Bob's Answer: Hey Micki, your tank's condition is not impossible, and not uncommon. You've got a persistent blue-green "algae" (actually bacteria) proliferation problem, that can be turned around in a few ways. The best is to alter the circumstances in the system to disfavor the bacteria, and favor some other groups of microorganisms. How much light do you have on for how long a day? You may well need to increase the strength and/or duration. What do you do for supplementation of your non-fish livestock's nutrient base? Does your live rock thrive? Do you inject CO2? What do you keep your Specific Gravity at? Ever alter your alkalinity, KH, temperature? You need to shake this system up chemically and physically to get rid of the Cyanobacteria. Question: What would you suggest as the best way to eliminate and to keep red slime algae (actually a bacteria Cyanobacteria) out of a reef aquarium. Bob's Answer: Harold, you touch on the gist of my approach in your query: prevention. I suggest a multi-prong approach to optimizing water quality and competition for light and nutrients rather than the all-too-common resorting to antibiotics to "treat" these moneran opportunists. For specifics: I'd utilize as much live rock as practical, both in my sumps/refugia as the main/display system(s)... if possible with alternating light/dark cycles on all. A functional protein skimmer is requisite on almost all types of marine set-ups (not just in my opinion)... if at all possible linked with an ozone generator (and possibly a desiccator for it in turn). As a "yardstick" I'd monitor Redox potential (350 units plus), and/or alkaline reserve, or at least pH (8.0 plus)... and probably at least cycle in and out every week or so, the use of a good grade of carbon as a chemical filtrant. Air infusion and circulation also delimit undesirable algae growth, so vigorous water movement is de riguer. What else? Oh yes, take care to not being an accomplice to the problem by not overfeeding foods that contribute to algae growth... That's about it. Question: I have been keeping a very successful SPS and soft coral tank for the last year and a half. It is a 75-gallon glass with a 20-gallon sump, 440w of VHO, a plenum substrate, and very active Berlin skimmer. I recently had my prized tank raised Bubble Tip (anemone) commit suicide by walking into a powerhead. Despite losing a few corals the tank appeared to battle through with help of many water changes. A period of time passed in which everything seemed fine, but then over a few days I experienced the biggest red Cyanobacteria bloom I have ever seen. It was everywhere. I consider myself somewhat knowledgeable in reef keeping, so I kept up the water changes to try to beat it. That did not work, though, and it appeared to be getting worse. After many basic methods: phosphate sponges, more circulation, larger water changes, I was getting desperate for a "cure." 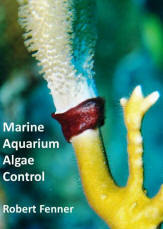 By the assurance of my reef-mentor that my corals would not stress I tried Ultra Life Reef's Red Slime Remover. It made a good dent in the cyano, and did not affect my corals at all. It recommends not dosing more than twice in one week, and in the lapse the cyano was able to rebloom. What do I do now? Is there a stronger product out there? Can I overdose without damage? This is destroying the image the tank holds in the house and I am willing to upgrade to a larger tank if a total restart is necessary. I can always buy more Savaii. Bob's Answer: Jeff, thanks for all the info... Yep, your system went out of whack, and the opportune organisms are having a hay-day... There are a few possibilities: continued massive water changes to dilute the real source of the problem (nutrients and lack of photosynthetic competition), more doses of the red slime remover (which should have the ill effects of repetitive dosing diluted along with the water changes), or my favorite bit of advice, another massive(50 plus %) change of water and the use of Poly Bio-Marine's Poly Filter (no, I don't own the co., or get a kick back) to remove the excess water soluble "materials" that are causing the problem. Try this out and stay in touch. Question: What would you suggest as the best way to eliminate and to keep red algae (actually a bacteria Cyanobacteria) out of a reef aquarium. Thanks. For specifics: I'd utilize as much live rock as practical, both in my sumps/refugia as the main/display system(s)... if possible with alternating light/dark cycles on all. A functional protein skimmer is requisite on almost all types of marine set-ups (not just in my opinion)... if at all possible linked with an ozone generator (and poss. a desiccator for it in turn). As a "yardstick" I'd monitor Redox potential (350 units plus), and/or alkaline reserve, or at least pH (8.0 plus)... and probably at least cycle in and out every week or so, the use of a good grade of carbon as a chemical filtrant. Air infusion and circulation also delimit undesirable algae growth, so vigorous water movement is de riguer. What else? Oh yes, take care to not being an accomplice to the problem by not overfeeding foods that contribute to algae growth... That's about it.